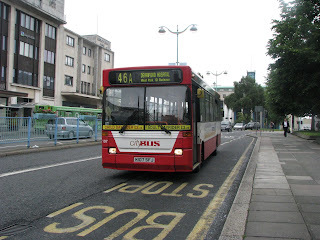 Public Transport Of The Plymouth Area: K reg Darts live on! Spotted in Callington yesterday was K107 SFJ one of the older Plymouth Citybus Dennis Darts that were withdrawn last year! This was operating a school service with passengers onboard. Was lovely to see one out again as I thought it was the end for these Darts, though they have been parked up at the back of Plymouth Citybus' Milehouse depot for around a year now as there is no demand for them they have been hard to sell. Picture shows her last year shortly before the bus was withdrawn.